Water Treatment Plant, Designed by Ionics, rated for 62 gpm, last treated city water prior to being fed into plating facility. 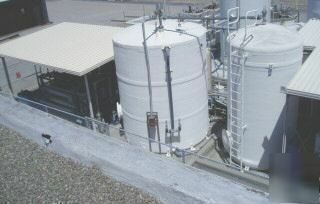 Plant includes Ionics 62 GPM Reverse Osmosis System, with (6) membranes and (2) deionized water tanks with (1) Pacific Tank 12,000 gallons and (1) Xerxes 6,000 gallon fibergalss storage tank. Incomplete, previously used in conjunction with Penfield Water Purification System. Includes depth filters, carbon filters and mixed bed demineralizers. Remaining compnoents are in good condition. Stock No. S733612.